Grooming Your Cat At Home – Quickly and Efficiently! - Petpav - Your Online Magazine for All Things Pet! Grooming Your Cat At Home – Quickly and Efficiently! One of the benefits of having a cat is they tend to groom themselves all day long. Unlike dogs, kitties include grooming as a part of their daily routine. However, sometimes our cats come across something smelly, roll in the mud or doe some other activity that would actually require a good clean. And as our cats get older, it’s harder for them to groom themselves. Sometimes, all they need is a good bath. First you need to prep your bathroom with a towel, pet shampoo, and a way to rinse all the shampoo off. And, then you hope your cat doesn’t freak out and you need to remember the end goal. You will get your cat smelling his or her best. Fill your tub with a few inches of water to get ready. Use a shampoo made specifically for cats or, in a pinch, a mild baby shampoo. Cats’ skin are more delicate than humans’ skin, and a harsh shampoo can make it dry and cause flaking and itching. Conditioners work well if your cat has a medium to long coat. Don’t be tempted to skip this step. A thorough brushing removes dust and other particles and loosens tangles, a step which is especially important if you have a longhaired cat. Wet tangles are much worse to comb out than dry ones. 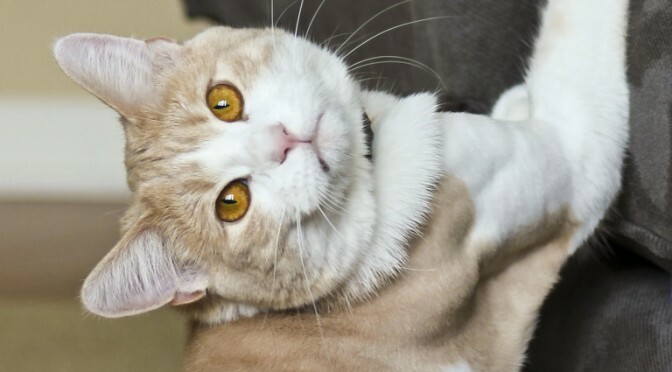 You’ll also want to make sure your cat doesn’t have any mats because matted fur can trap soapy residue next to his skin and cause itchy, flaky patches. As we cat owners are painfully aware, our cats will not hesitate to use their claws when they feel threatened or scared. It would be a good idea to wear long sleeves or a jacket while cleaning you cat. ; even something to cover your face would be advised if your cat is a real scratcher. Pick up your cat like it’s just another day and pet him or her. Get your kitty to be a little happy and carry him towards the bathroom. Once you get to the bathroom, close the door and you are half-way there. This is not so different from trying to get your cat in his crate or box when you go to the vet. Even though cats are quick, nimble, and can shred a shower curtain in two seconds sharp, you CAN control them. Hold your cat as best you can and if you have a sliding glass door, close all openings except where you are kneeling. If your cat is really miserable, you might consider getting into the tub with him or her and closing the glass shower doors completely. Sit on the ledge and begin wetting your cat down. Be careful of your kitties’ face and ears. You don’t want to get water in their eyes, ears, or nose. Remember, the quicker that you get your cat washed, dried, and cleaned, the sooner it is over. So if possible, wet your cat down, shampoo, and rinse in one motion! Having a few inches of water in the tub will not only slow your cat down but will also wet his feet, legs, belly, tail, and give you a few seconds to get his back wet. The head is last and often the hardest. 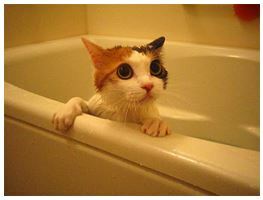 You may want to avoid your kitty’s head or do it after he or she is out of the tub. Shampoo your kitty quickly and begin rinsing by turning on the shower or faucet and quickly moving the water over his body. Obviously, a wet cat is slippery cat. Don’t expect to be able to hold your kitty for more than a few seconds at a time. This is when the glass doors of the shower come in handy. Your kitty may run around but he can’t get out. Rinse like crazy and then get ready for the final step – drying. Drying is going to be simple compared to the previous steps. Reach for the towel, wrap it around your cat, and carefully lift him or her out of the tub. If he squirms let him sit on the floor as you dry his fur and get most of the water off his tail, legs, and belly. Now you’ll have a clean, cat (most likely, angry) walking around the house for a few hours. Of course, make sure to give your kitty a treat or toy for his the misery you have just caused him or her. And a nice rub down and kiss if your kitty lets you near him or her. Treats are a nice way of saying ‘thank you’’ and “sorry” at the same time and rewarding your kitty’s excellent behavior. Good luck and know that the next time you decide to groom your kitty, it will only be that much easier.